Living in a multi-dog household versus a one-dog household is akin to roller skating versus salsa dancing while swinging from a trapeze while wearing scuba gear and juggling roller skates. One is pretty straightforward (at least comparatively speaking), and the other is just a f! @#ing mess. Which is why the first time I tried walking just one dog at a time, I felt like I’d exchanged my roller skates and scuba gear for a Segway. Before adopting Peaches, and taking the time to read and learn more about dog behavior, my husband and I were living in a split-level condo with no yard and two dogs. So our daily routine involved three walks a day with both dogs down to the local park and back. Our two rescue dogs, both of whom we adopted as puppies, were 6 months apart. Neither had any significant behavioral issues. However, every time we walked them and passed other people or people with dogs, our younger dog Hudson would get worked up and redirect on our other dog, Charlie. It was no big deal and manageable, but nonetheless stressful. During the first five years of these two dogs’ lives, we never once took either of them anywhere by themselves. When we did anything with them, it was always together. We might have varied where we went, for how long and with whom, but no matter what, we always made sure to take both dogs. Once we transitioned to a three-dog household, and then four shortly after, walking all of our dogs together became pretty unrealistic. That was also about the time that I started taking regular obedience classes with a local animal behavior consultant and dog trainer and learning more about leash training and dog behavior. 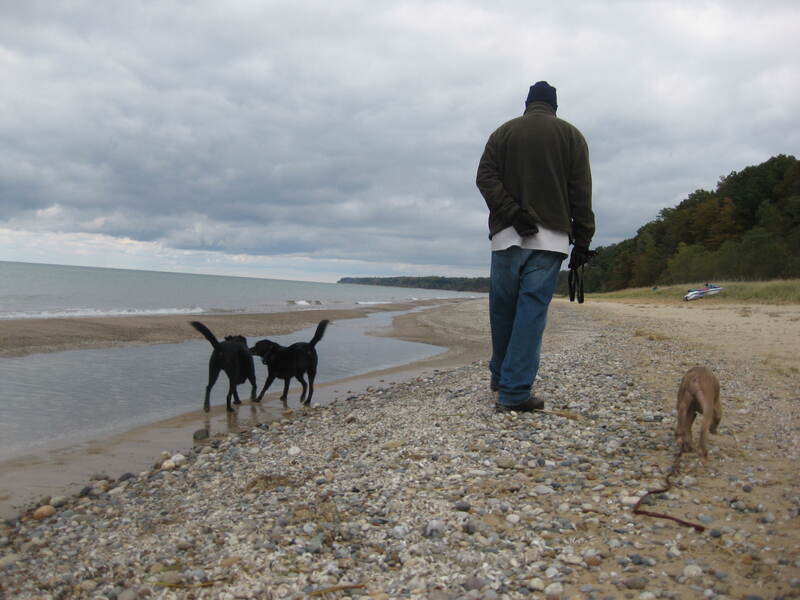 Eventually, I started taking just one dog at a time on walks in and around where I lived. Sometimes it was a 45-minute walk, sometimes it was as short as 15 minutes. But, it was always just one dog at a time. And that’s when something remarkable happened: I fell in love with dog walks and I actually learned something about each of my individual dogs. As it turns out, our dog, Hudson, who I always assumed was the problem dog, redirecting on Charlie and being reactive towards other people and dogs, was not the problem at all. Charlie was the reactive dog, and Hudson was reacting to him. Hudson, as it turns out, is our easiest and most enjoyable dog to walk. He trots along at whatever pace we’re willing to move, rarely lingering too long at any given spot and totally ignoring even the most reactive of dogs that we pass. Occasionally, I’ll walk Hudson and Peaches together because Hudson’s presence relaxes Peaches, who can get pretty nervous in new or stressful situations. Dogs are different when they’re by themselves. And taking the time to walk, train and travel 1-on-1 with your dogs can offer you infinite insight into who they are as individuals and what their potential training and enrichment needs might be. 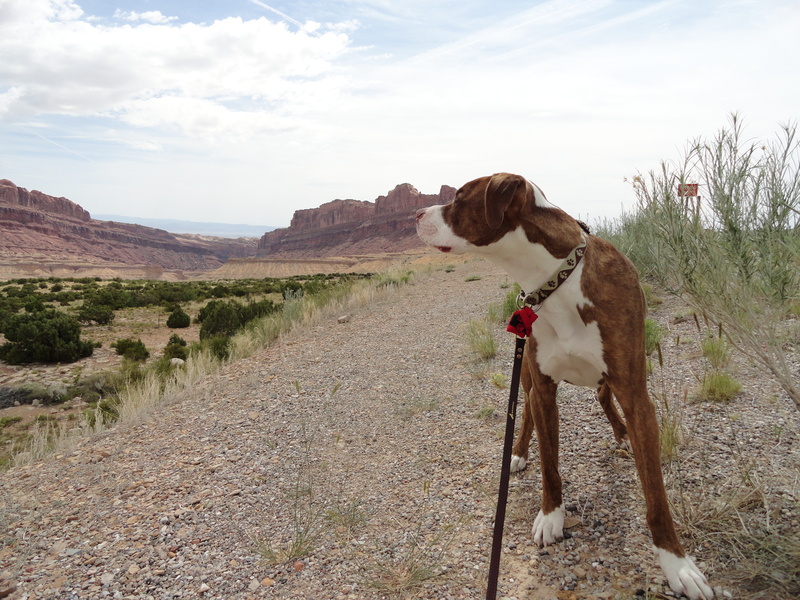 A couple years ago I took a road trip from Michigan to Utah with just one of our dogs, Buster Brown, and it was one of the most enjoyable and enlightening bonding experiences I’ve ever had with a pet. I cannot emphasize enough how life-changing it was for me when I bothered to discover how much more enjoyable and productive three 20-minute walks with one dog at a time can be instead of one hour-long, action-packed walk with all three dogs at once. Quality of a walk (for both dog and human) is considerably more important than duration. One at a Time. 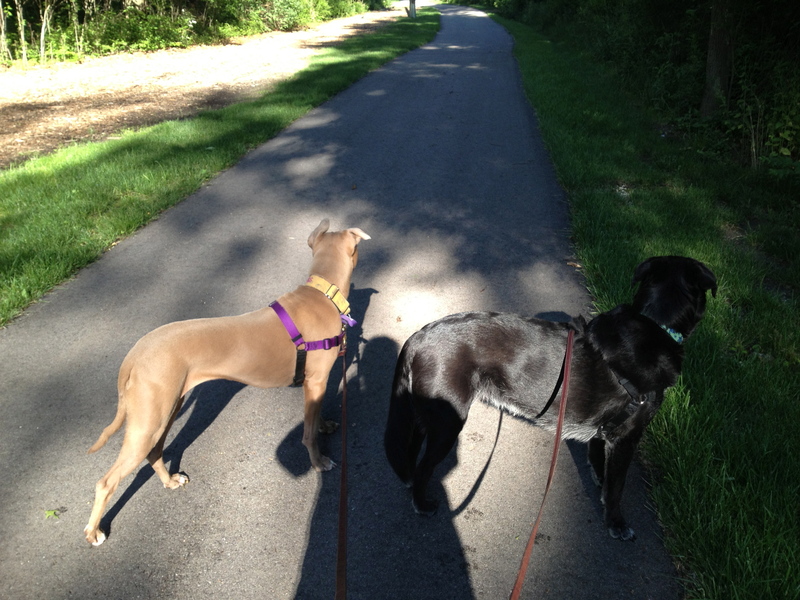 We’ve had lots of clients who had nothing but trouble trying to walk their two or three dogs around the neighborhood. Perhaps one dog was reactive to other dogs and set the rest of the group off . 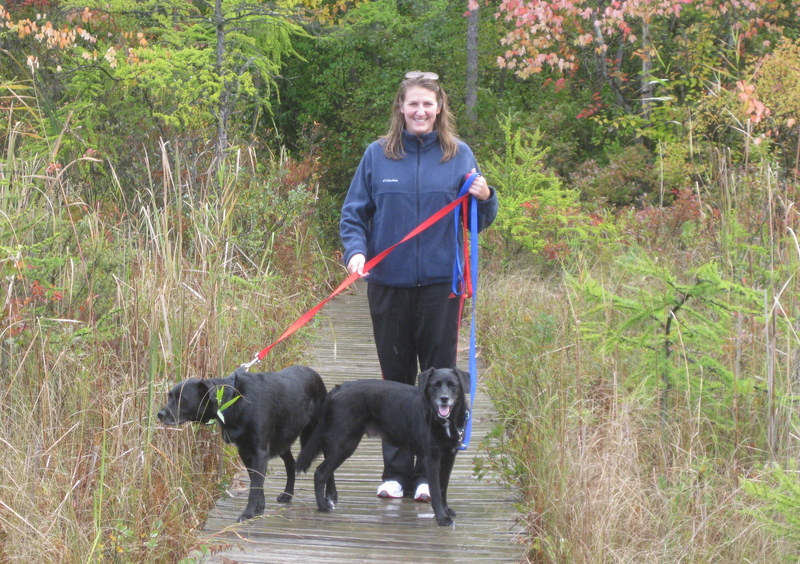 . .
All of these clients were grateful when we said: “You know, it’s okay to not walk all your dogs at the same time.” That may seem like a stunningly obvious thing to say, but when you’re the one in the middle of a forest of paws, it’s easy to lose track of the path out of the woods. . .
Of course, separate walks take lots more time, and you simply may not have it. That might not be a problem–in some cases your dog might be better off skipping neighborhood walks . . you can use trick training and exercises inside the house and yard to keep the non-walker busy and in condition. For just a few days, try walking each individual dog for 15 or 20 minutes each and note the difference for both you and that dog. Is it more enjoyable for you? 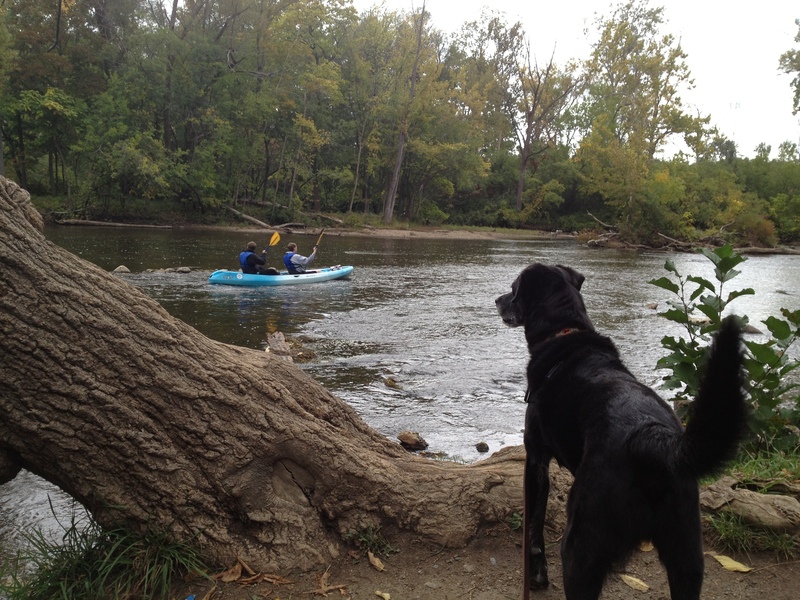 Does the dog seem more or less anxious or relaxed? What kind of body language are they exhibiting? How often do they stop to sniff? For how long and where? Do they move slower or faster than they do when they’re with the others? Are you able to go different places than you normally would or pass different types of people or dogs or distractions? 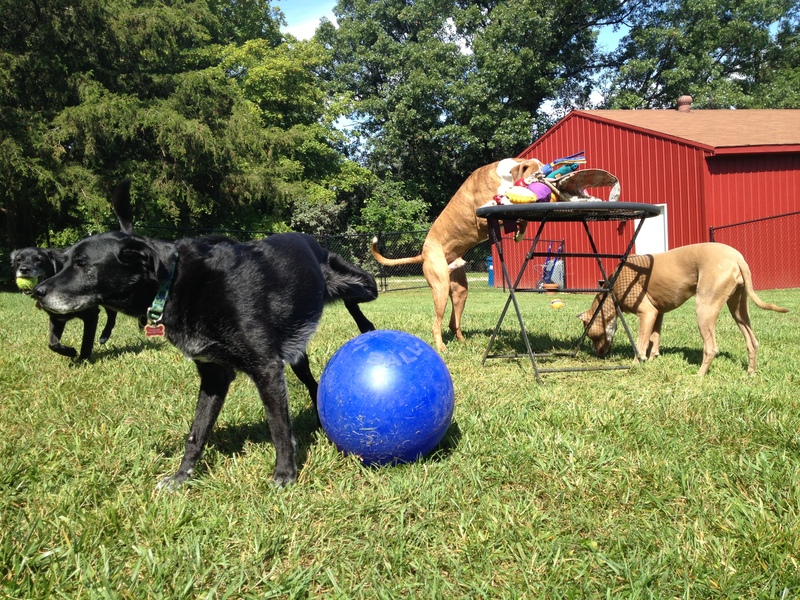 Do you notice anything different about the energy level of individual dogs or the group when they’re back at home? Or if you just find that too boring to handle, then maybe you can try for John Garcia’s Guinness Book of World Records dog walking record. Was it 22 or 25 dogs at once? Not that it matters at that point, and not that any of us are as cool or adept at working with dogs as John Garcia. *A point of clarification: When I refer to “one dog at a time”, I mean to indicate one leash and dog per person. It of course still counts as “one dog at a time” when you’re walking with friends who also have their dog(s) with them. “One at a time” simply means that you only have one dog at the end of your leash to focus on and handle at that moment. This entry was posted in Animal behavior and training, Animal Welfare, Best Friends Animal Society, Uncategorized and tagged Best Friends Animal Society, dog behavior, dog ownership, dog training, dog walking, John Garcia, leash training, multi-dog households, multiple dogs, one dog at a time, Patricia McConnell, reactive dogs. Bookmark the permalink. Hi Emily. Another good post. Thank you. I recently read that section in Patricia’s book about taking the dogs one at a time, and it was (embarrassingly) an “aha” moment. 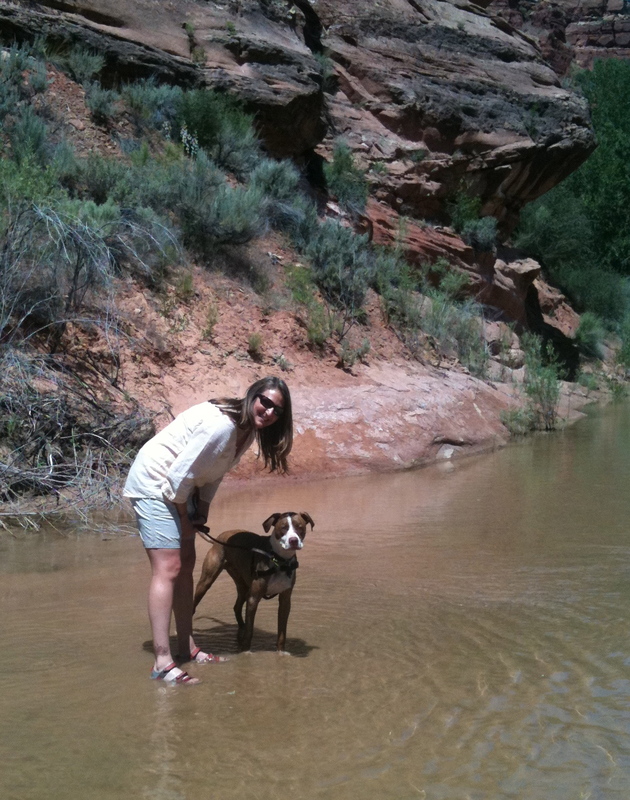 Now I mostly do on-leash walks separately with the girls and unleashed trail walks together. A lot less stress for certain. i have 2 dogs and i walk and doggysit other peoples dog and walking them 1 at a time was never worth it for me, my 2 dogs are really well trained and i find they calm the other dogs out. if i were to walk all the dogs individually it wouldnt be fair because we go for 3-4 hours walks and considering i work till 5 walking each of 3 or sometimes 4 dogs that long just wouldnt be possible. i find a well balanced pack helps keep the new comers calm. i just finished watching a dog, that with his owner goes after bikes and men(with no dogs), when i walked him with my 2 he didnt even react. so i dont agree that walking 1 at a time is good, the problem is that people dont train their dogs to not react or to even simply walk on a leash. so yes in those cases 1 on 1 might be good but what would be the best is training. Hi Steph- That’s so great to hear that you’ve had such wonderful experiences walking multiple dogs. Nice job! And of course not everyone has or needs several hours a day to walk multiple dogs individually. The point of the post isn’t to suggest that walking one dog at a time is better or worse. This is simply a discussion about the importance of recognizing your dogs as individuals and learning to value their individual personalities and needs. You can’t possibly know who your dogs are and what their individual training and enrichment needs are if you don’t spend 1-on-1 time with them–observing their behavior and building a relationship with that one dog–in addition to the group time. It’s no different than human relationships and individual needs. Imagine if your parents never once spent any quality time with just you–getting to now you as an individual and learning about your needs, likes, dislikes, etc., and instead only knew you as you existed among your 3 or 4 other siblings? I agree with you that training is very important. And good training doesn’t happen in a “pack.” Training is about assessing an individual dog’s needs (i.e. reactive to bikes and men = a dog who needs some support and help developing positive associations with those things through classical and operant conditioning). I’d also recommend that you take some care with walking dogs for 3-4 hours at a time, which it sounds like you’re very thoughtful about. Dogs living in the wild wouldn’t personally choose to be out walking or exercising for that long. That’s not a normal species behavior. Different dogs of different ages, sizes, physical fitness levels and breed all have different exercise needs and capacities and not everyone is built for a 3 hour walk. Many dogs, if given a choice, wouldn’t choose to walk for that long at one time. Which is why it’s nice to assess each dog as an individual first to determine what might be best for that dog, and not just for us or the group. you get to know your dog individually when training is done as you cannot train 3 dogs at the same time as you mentioned, but i believe it is better for dogs to be walked together as a pack. as for the amount of exercise by dogs get yes i walk them 3 hours, we go hiking every day, either in the woods or around the lake, and of course i do not bring the 13 year old lab with me in those cases. 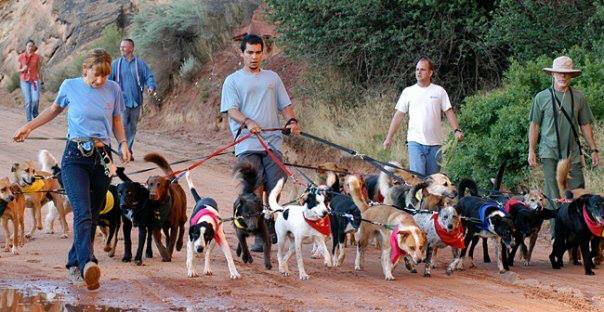 each dog has his needs but most dogs will never suffer from walking to much. i am not saying i run with them for 3 hours straight in the boiling weather, we have a nice slow and faster at time walk either on leash or off leash depending on the location and the population level around. of course if it is a hot day and its 40c we will do many short walks instead of 2-3 longer ones. so yes one on one time is important when training but i believe and have seen, dogs are more happy walking in packs. my friend has 2 great danes when he walks alone with one dog or even with both his dogs one of the great danes stays behind and walks very slowly. but when our group joins him and all the dogs walk together (usually around 15 dogs and their human) the grate dane changes she walks at the same level as the other dogs, walks at the same passe and has her head high. but again there is no one size fits all book on how to train dogs, just like parenting, what might work for one wont necessarily work for all. it depends on the human behind the leash. Thanks so much for the nice message. Yeah, I think there’s some weird shift that happens when we go from 1 to 2 dogs, and then from 2 to 3. With just two dogs, it’s just so easy to think about the pair as one individual unit, rather than as two unique dogs with their own needs, even though they may do well together most of the time. Going from 2 to 3 really helped me regain some perspective and recognize and bond with each dog again. We have so much “group time” at home or if we go on trips, I want walks and outings to be special and more customized for the individual dog. Glad to hear you’ve been having the same positive experience! Hello there! I just found this post and I loved it! I was wondering, though, did you experience any separation anxiety with the dog(s) left behind? I have two labs and the one who is left behind cries, barks, and whines (the other one sometimes pees when left inside) when I take the other for a quick walk. I am working on trying to keep them calm and address the separation issues but the walking part seems to be my biggest wall. Especially if no person is here with them to help distract them. Any suggestions? Thank you! Hey Amber- Thanks so much for the comment and question. So, for the most part, this has not been a problem for our dogs because there’s always some kind of circumstance when an individual dog needs to be taken somewhere (i.e. to the vet, to training class, on a fun outing). So, the concept of other dogs leaving isn’t completely foreign to the them. Our oldest dog, Charlie, in certain contexts will do some stress barking/whining when we first leave with another dog on leash. But we’ve solved this problem by simply walking him first or leaving him in another area of the house with a high value treat of some kind so we can get out the door. In general, I never leave the house (with or without a dog) without giving the dogs a treat of some kind. If you’re guys definitely struggle with the separation anxiety, I’d first try establishing a routine where you give the dog you’re leaving something to do or something to find in another room (i.e. hiding treats in boxes or on the floor or just leaving them a frozen Kong with really good stuff in it). Once they get used to that routine, you can try leaving with the other dog while they do that. Sometimes it’s just a matter of “out of sight, out of mind” and giving them something equally valuable in place of the walk. But I’m sure it all depends on how dialed into certain routines they are. So glad I found this! My husband and I are officially foster failures with our first foster, and while he’s a wonderful dog he is not leash trained yet and walking both dogs (our resident dog being a bit reactive) are very difficult. Now I feel I have “permission” to walk them separately. I was thinking of alternating morning walks and evening walks with each one: dog 1 in morning and dog 2 in evening one day, then dog 2 in morning and dog 1 in evening next day. Of course they get midday outings from our dogsitter, hikes with me and my husband, and copious playtime together in the yard. I have Patricia McConnell’s book and skimmed it last night … will go back and re-read it tonight!